Each of this shields can be connected to the Internet via PPP(Point to Point Protocol). For this tutorial, we have written a script to install and perform the required steps. Please choose your Sixfab ShieldYou will be offered to choose among the mentioned three shields. Then it will fetch required scripts for you. Do you have updated kernelIt asks if your kernel is up-to-date. If no[N] it updates the kernel else it skips the update. Then it installs ppp. What is your carrier APN?Here, it asks for your carrier’s APN. For me it is hologram. Enter your PORT nameIn this step you will enter your PORT. For 3G, 4G/LTE Base Shield it will be ttyUSB3. Do you want to activate auto connect/reconnect service at R.Pi boot up?This option allows you to connect to Internet via your shield automatically when your Raspberry Pi Starts. If you want to connect to Internet automatically type y else N. If you have selected N then you will need to run sudo pon to connect to internet and sudo poff to stop it. Works great as well as all the sensors. However, I can’t get figure out how to access the GPS status, longitude, latitude, etc. Will there be documentation and/or samples for GPS as well? With the PPP taking the serial/UART, will I still be able to access the eGPS data? You can use USB interface to access GPS Data. Here is a tutorial showing the process of accessing GPS Data. Yes, you will be able access eGPS Data. Here are the link for BG96 GNSS AT Commands Manual mentioned in our product details. this guideline is great and I did work my shield, but I have realize that when I restart raspberry pi, shield try to connect to GSM, since it was configured on that way in file install.sh. I was wondering if you could tell me where is stored file with AT commands to configure LTE CAT-M instead of GSM and also how to changet APN. There, you may use setMode() to get LTE Cat M1 mode, NB-IoT mode or GSM mode. Check here for more details. I am using the Sixfab RPi CellularIoT App Shield and trying to connect to internet using a vodafone ireland normal sim. I am using this in conjunction with the Raspberry pi 3 running ubuntu mate. Could you please help what am I missing as i am not getting a remote ip ? So I am having some issues installing this on Ubuntu Mate 16.04. I run the install script and everything installs correctly with no errors. However, when I reboot nothing happens. The stat light is dimly lit and there is no activity on the blue light. (I have to press the pwr button in order for it to “power on”) . Once powered on it wont connect. I run sudo pon and it just fails everytime. “status = 0x3 Connect script failed” This is a fresh install of Ubuntu. Any ideas? Thanks! Please share the whole error log. Works on CZ t-mobile. Tested. I tried this but I haven’t manage to get it to work. 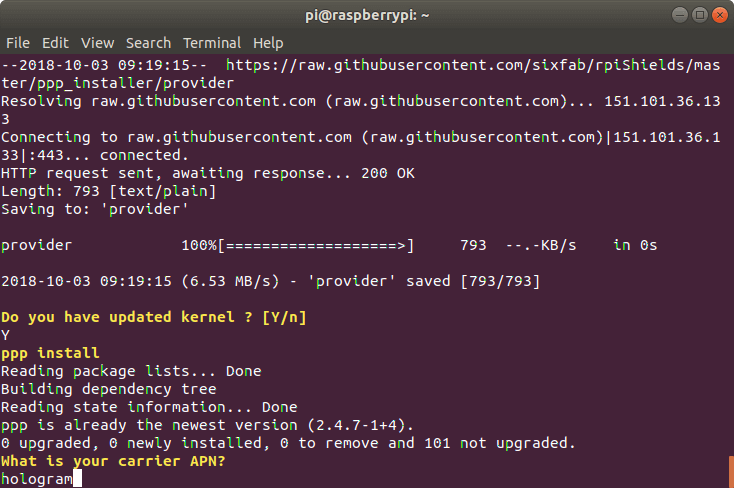 I use Raspbian on my raspberry pi, does it has anything to say? I use the quectel EC25-E with the shield v2. I tried my SIM-card on my phone and find the correct APN here. My SIM-card has turned off the PIN-code. Does I need to do any changes because of this? What is the error are you getting? Please share the log. Which antennas are you using? Is your Power supply sufficient? Does your sim ask for sim pin code? If yes please remove it. After i pressed “Y” on the question of auto-connection the raspberry re-booted and I couldn’t see anything special. I don’t know what changed but the next day it worked after i powered on the raspberry again. I later tried to take out and put in the sim-card again to see what happened. At first it did not work again, tried to reboot and still no change. When i turned the raspberry off, unplugged it from the power supply and then started t again. After this it worked again. Found out its probably because I used power supply form a computer USB. But I have changed that to an more suitable adapter. I use “Raspberry Pi 3G-4G/LTE Base Shield V2” with EC25 Mini PCle 4G/LTE Module. Please tell me how to setting above. 1.APN Name: While installing the script you are asked for apn. OK,about “User Name and Password”. So,How to setting “APN Name” ? What & Where I must write this characters. Hi, Please take a look at the 3rd image of the tutorial. It shows the apn setting. So,Finally, I must set Certification method. I understand PAP and CHAP. So,I want to know that How to write setting file on Raspberry pi. Where is a setting file for Raspberry pi(stretch) choose certification method. 2.How to write setting file. I think serial connection of LTE network was successed. I’m trying to use a Raspberry Pi 3 with the 3G-4G/LTE Base Shield V2 set with the EC25 Mini PCle 4G/LTE Module. It worked well on the USB port but I can’t make it work with the serial GPIO for some reasons. I read it could come from the mini serial that is used by default on the GPIO. Any idea of how use it directly ? 1. Did you bridge the UART resistor sections available under the shield? 2. Did you enable Serial port hardware and disable getty service? pppd: Please load the ppp_generic kernel module. You will need to update the kernel for the board. I am trying to follow the steps, but after the final question “do you want to activate the reconnect service?” my whole Raspberry Pi shuts off and reboot. I have a 5V3A charger, an EC25-E module and a V2 Base Shield. I am using my Virgin Mobile SIM card, with the goto.virginmobile.uk APN. Would anyone know what is going wrong? to connect to the internet. Check if the script has created reconnect service? If you have to delete and re-add the default ppp0 route restart your network or at least i had too for the new route take effect. I use a SIM card for eplus (AldiTalk) which works in another Router perfectly. In this router (3G router) the 3G authenitcation method is set to “none”. Make sure your APN is correct. I found the APN to be internet.eplus.de from a website. Thank a lot by your support. I bought a sixfab for 3G, 4G/LTE base shield V2 in order to connect to my carrier T-mobile. I’m using a Quectel EC25-AF. I try to follow your post but I can’t connect or surf. What I’m wrong?. Attached the log. Thanks by your help. I tried internet.eplus.de also before with the same result. Then I switched to internet because my 3G Router uses this APN and can connect to the internet with it. I am doing my senior design, and the system need to be connected to cloud, as well as GPS coordinates, I would really grateful if you could help me to find a tutorial which provide those information. Do you have powered up your shield? What is the status of the LEDs? yes, I have powered up the shield, the status LED was blinking. Yes sir, I have checked, the red power LED is ON, and the blue status LED is blinking. do you have any further ideas how to get a connection in my case? Do you have powered up your module? Yes, you can use it via UART. Which shield should I select when i launch install.sh for the Raspberry Pi Cellular IoT HAT ? In what way should I power it? I have the hat connected to the Pi via the I/O header and the USB-cable. Does it need separate power supply, and where should I connect it? For you Raspberry Pi Cellular IoT HAT, connecting through UART is enough. There is no need for a separate power supply. when i use the sudo pon command i get this output. Please mention which shield/HAT are you using? Do you have enabled your serial hardware? Hi Saeed, Thank you for the update. I’ve installed ppp for my Raspberry Pi Cellular IoT HAT. I’ve chosen the GPRS/EDGE technology. APN : Sunsurf (Singapore) Port : ttyUSB0. Apr 18 11:34:49 beam pppd: Exit. Apr 18 11:35:22 beam pppd: Exit. Could you please change ttyUSB0 to ttyS0? I succeeded for install model 4G with my Rasp Pi follow all step you shared , now i can connect internet normally. I trying to check status of internet connection by AT command code but it not work. so , Can you help me !